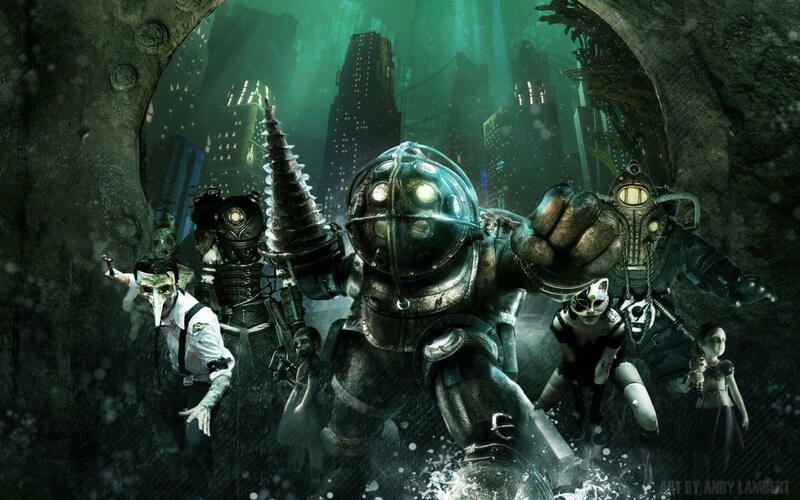 BioShock, one of the most well-regarded first-person shooter franchises ever made, is celebrating its 10th anniversary today, and publisher 2K Games isn't wasting the opportunity to pull long-time franchise fans back in. Today, the publisher has announced the official BioShock 10th Anniversary Collector's Edition, which is slated to release on November 14th this year for PS4 and Xbox One owners (but been no word on PC availability yet). The 10th Anniversary Collector's Edition will include an 11" Big Daddy & Little Sister statue - complete with lights, sounds and a motorized drill. From the pictures 2K has provided us with so far, it looks like the Big Daddy's mask and the Little Sister's eyes will be the light-up portions of the statue. Although the statue is undoubtedly going to be the highlight of the Collector's Edition for most, there's a couple other goodies included as well - specifically, a "numbered certificate of authenticity" and BioShock: The Collection, a game pack containing all three BioShock titles and their accompanying DLC, fully remastered for current-gen consoles (originally released back in September last year). In terms of pricing, BioShock's 10th Anniversary Collector's Edition will run you about $200 at the moment. While $200 isn't out of the ordinary for video game collector's editions, in this case the contents are a bit limited for the the price tag. Since BioShock: The Collection can be purchased separately for $40, you're essentially paying $160 for a statue, a certificate of authenticity, and a fancy box. Considering the fact that many other game collector's editions include things like art books, soundtracks, steelbooks and maps, BioShock's collector's edition feels a bit underwhelming by comparison. Still, if you're a die-hard BioShock fan, there are far worse ways to spend your money - and to show your support for the franchise and the company that's made it all possible. If that money is already burning a hole in your pocket, you can pre-order the pack for yourself via GameStop's website or 2K's own online store.